Is There a Method to Social Media Madness? SMB adoption of social media for sales, marketing, product development and customer service is on the rise – but how are SMBs tracking, analyzing and measuring the success of their social media endeavors? 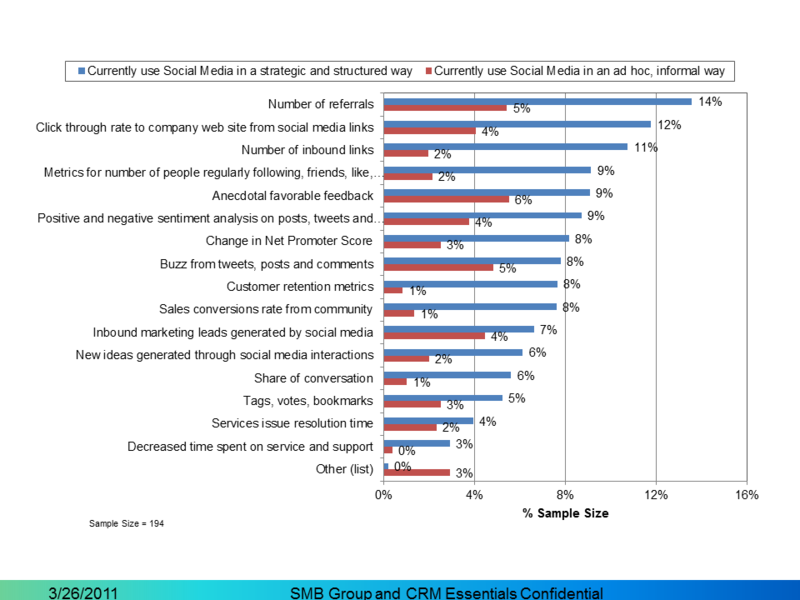 In our joint SMB Group/CRM Essentials “2011 Small and Medium Business Social Business Study,” we surveyed 750 SMB (small business is 1-99 employees; medium business is 100-999 employees) decision-makers about their use and plans for social media for sales, marketing, customer service and support, product development, HR and other business functions. In the medium business segment, over half (52%) of respondents indicate that they currently use social media. Among these respondents, about 19% say they use it in an “ad hoc, informal” way, while 33% indicate they use it in a “structured, strategic” manner (Figure 1). When we take a deeper look at how medium businesses using social media track, analyze and measure success of social media efforts, we see that companies that take a strategic approach are more likely to incorporate a greater number and more actionable metrics to measure social media effectiveness than their informal, ad hoc counterparts. For strategic users, actionable, customer-centric metrics such as referrals (14%), click through rates (12%), and inbound links (11%) top the list. These are followed by social media measurements such as number of followers and friends (9%), and sentiment analysis (9%), along with anecdotal feedback (9%). Companies that use social media in an ad hoc manner are more likely to rate “softer”measurements, such as anecdotal favorable feedback (6%) and buzz from social media(4%) as top tracking criteria and yardsticks for success. Not surprisingly, SMBs that take a structured, strategic approach—and use more actionable metrics—are also more satisfied with the results of their social media efforts than those engaging in an ad hoc manner. This underscores the need for better integration of social media with traditional sales, marketing, and service/support solutions, along with better tools to track and measure results. For SMBs to truly evolve into “social businesses,” they need to be able to easily track, measure and tweak the results of their social media investments across a wide range of business activities, from product development through marketing and customer service . Although the social media drumbeat is loud, SMBs’ enthusiasm will be curbed if they can’t figure out what impact their social media initiatives are having on business strategies and processes. Whether on their own or via partner solutions, vendors must provide SMBs the tools they need to integrate and evaluate social media efforts into their larger business strategy and framework or risk having those efforts falter. Because social media engagement does not occur in a vacuum, businesses will want to measure social media efforts in context of broader sales, marketing and customer service or other initiatives. Although vendors focused on collaboration, CRM, marketing automation and other related areas are integrating social media into existing solutions, few provide the analytics required to track and measure the effectiveness of social media and its different channels in an actionable and streamlined manner. Previous Previous post: What is Systems Management, and Why Should You Care?